The Committee on Climate change has produced its long awaited statement on how aviation should be included in the UK’s 5-year carbon budgets. The Climate Act currently omits international aviation and shipping, but while setting budgets, the CCC has to “take account” of’ these emissions. The government must decide by the end of 2012 on whether to include them in the Act. The CCC recommends that international aviation and shipping should now be included on the basis of the EU ETS cap, and that actualUK international aviation emissions should be back at the level they were in 2005 by 2050. The CCC has recommended against including the non-CO2 effects of aviation for the time being, though these NOx etc impacts of other sectors are included, and it presumes – optimistically – that technology may be able to reduce the problem in coming decades. The CCC says international aviation emissions should be added to currently legislated budgets, based on the UK share of the EU ETS cap. This would be 31 MtCO2e per year – which is 155 MtCO2e over the three 5 year budgets, taking us up to 2027. The 31 MtCO2e figure is 97% of the level of UK aviation emissions between 2004 and 2006. In 2005 UK aviation emissions as estimated on the basis of bunker fuel sales were 35 million tonnes. So 31 million tonnes would be the level of aviation emissions that were entered into theUK’s carbon accounts for the purpose of the Climate Act, which is perhaps a bit below what it is now. However, it would not stop UK aviation emissions from rising. The airlines would just have to buy more permits for any emissions over this level, so they can continue to grow, if conditions permit. On this, the CCC thinks that, if the recession ends, the price of carbon will rise and the number of permits will become more scarce, particularly after 2030, and so it will become much more expensive for aviation to expand. Market forces will prevail. The CCC therefore thinks that the UK should plan its infrastructure and investment on the assumption that actual emissions from international aviation from the UK will be no higher in 2050 than in 2005 – around 35 Mt CO2. The emissions level of 31 Mt would not take account of the problem with biofuels, which are currently zero rated for CO2 emissions purposes under the EU ETS, which is manifestly not correct, and will be changed eventually. UK aviation emissions grew around 120% between 1990 and 2005. Due to the inclusion in the 5 year budget targets of aviation & shipping, in order to meet the overall cut in UK carbon emissions of 80% by 2050, the CO2 emissions of all other sectors have to be cut by around 90% of the 1990 level by 2050. Aviation would therefore, under these recommendations, be getting a very generous deal indeed. But in order to impose stricter limits on UK aviation, there would need to be restrictions that are tougher than those in other European countries, and this government has repeatedly said it is not prepared to disadvantage UK business. See also the AEF press statement below. The Committee on Climate Change (CCC) has today recommended that emissions from international aviation be formally included in the UK’s carbon budgets. The Climate Act 2008 commits the UK to cutting emissions by 80% of 1990 levels by 2050, with a system of annual carbon budgets ensuring that the target is delivered. The Act currently omits emissions from international aviation and shipping but requires the Government to reconsider whether they should be included in 2012, with advice from the Committee on Climate Change. Already the Committee is required under the Act to ‘take account of’ these emissions when setting the carbon budgets for other sectors, so formal inclusion of aviation and shipping should not in fact have any impact on the carbon budgets that have already been set for other sectors. In 2009 the Labour Government asked the CCC to advise on how aviation emissions could be returned to 2005 levels by 2050. The Committee concluded that after taking account of likely improvements in aircraft technology and air traffic management, and allowing for the possibility of 10% of aircraft fuel by 2050 being from sustainable sources, the ‘stabilisation’ target could allow for a 60% growth in passengers. Even allowing for the introduction of carbon prices through the EU Emissions Trading System, however, the CCC predicted a growth in aviation demand of 115%, or 105% if no new runways were built anywhere in the UK before 2050. In other words, demand would need to be restrained if it was to keep to the 60% growth increase that would be compatible with the target. The Committee has not analysed the CO2 impacts of any particular airport proposals and makes no specific recommendations in relation to airport expansion. Nevertheless, its recommendations underline the importance of ensuring that realistic climate change considerations are among the framing conditions for the new airports policy, the draft of which will be published this summer. AEF strongly supports the inclusion of aviation emissions in the UK’s carbon targets and budgets, to support action which we are actively engaged in progressing at European and international levels. The sector’s emissions have historically grown rapidly, and the only reason for their being omitted when the Climate Act was agreed in 2008 was a technicality about how to account for them – an issue that can now be easily addressed using data collected through the EU Emissions Trading System. People in the UK fly more than anyone else in the world, so it is right that the UK takes a leading role in tackling aviation emissions growth. The Committee’s recommendations would give aviation considerable leeway compared with other sectors but would ensure that aviation in future participates transparently in the UK’s efforts to bring our economy within sustainable limits. The time has come for aviation emissions to be brought within the UK’s carbon budgets, the Government’s official climate advisers said today. 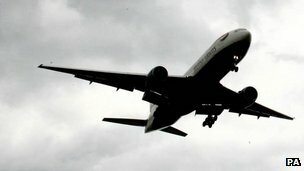 The 2008 Climate Act omitted emissions from international aviation and shipping because of debate about how account for them, but the data now exists – including, for aviation, emissions information collected through the EU Emissions Trading System – to make this possible, says the Committee on Climate Change. The Committee is already required by the 2008 Act to ‘take account of’ these emissions when setting the carbon budgets for other sectors, so formal inclusion of aviation and shipping should not in fact have any impact on the carbon budgets that have already been approved by Government for other sectors, and for the UK as a whole. “People in the UK fly more than anyone else in the world so it is right for us to take the lead in tackling the growth in aviation emissions. “If the Government accepts the advice of its climate change advisers, aviation will be included on much more generous terms than those agreed for other sectors, with aviation allowed to increase its emissions by 120% of 1990 levels by 2050 while other sectors are expected to make cuts of 80% by then. But by including aviation in the carbon budgets we can make sure that the books balance and that steps to move the UK towards a greener economy aren’t scuppered by runaway aviation growth. There is no longer any reason to exclude international aviation and shipping emissions from carbon budgets according to the Committee on Climate Change. This was the conclusion in the Committee’s report “Scope of carbon budgets – Statutory advice on inclusion of international aviation and shipping”. Emissions from international aviation and shipping were initially left out of carbon budgets and the 2050 target when the Climate Change Act became Law in 2008, with the decision on inclusion delayed to 2012. In the meantime, the Committee and the Government have acted as though international aviation and shipping emissions are in the 2050 target, based on a certain interpretation of the legislation. The risk is that a new Government would not adopt the same interpretation. In order to mitigate this risk, the Committee recommends that the current approach should be formalised through including international aviation and shipping emissions in carbon budgets and the 2050 target, therefore providing more certainty that it will be continued in future. Moreover, inclusion would provide the most transparent, comprehensive and flexible accounting framework under the Climate Change Act. – International aviation emissions should be added to currently legislated budgets budgets based on the UK share of the EU ETS cap (i.e. 31 MtCO2e per year). – International shipping emissions should be added at around 9 MtCO2e per year, based on a projection of UK emissions which reflects current international policy (i.e. the Energy Efficiency Design Index (EEDI) adopted by the International Maritime Organisation (IMO)). The implication of inclusion on this basis is that there would be no new commitments or costs in aviation, shipping or other sectors of the economy. For example, commitments and costs relating to aviation have already been made in the EU context, and would simply be reflected in carbon budgets. The Committee’s report also shows how a 2050 target including aviation and shipping emissions could be achieved, building on its own previous work and that of the Government in the November 2011 Carbon Plan. The analysis in the report reinforces other studies which suggest the 2050 target [for the UK as a whole] can be achieved at a cost of 1-2% of GDP. This cost was previously accepted by Parliament when the Climate Change Act was first legislated, given the much higher costs and consequences from not acting to reduce emissions. The long-term emissions pathways in the report highlight the need for deep cuts in emissions from the power, surface transport, and buildings sectors. They justify the current policy approach which is aimed at developing and deploying a range of low-carbon power technologies (i.e. nuclear, renewables, CCS), improving energy efficiency in buildings and supporting renewable heat investment, improving fuel efficiency of conventional vehicles and catalysing development of the electric vehicle market. On the long-term path for aviation emissions, the Committee recommends that the aim should be for emissions in 2050 that are no higher than 2005 levels. Given scope for increased fuel and carbon efficiency of flying, this would allow some demand growth over the next four decades. The Committee suggests that this path should be delivered through EU and global policies rather than a unilateral UK approach, in order to avoid competitiveness impacts that could otherwise ensue. “Including international aviation and shipping emissions in UK carbon budgets has an importance which goes beyond the specific issue of international aviation and shipping. This report makes a recommendation which, if now accepted by government and Parliament, will complete the UK statutory framework. From the CCC report Presentation Slides – Page 15. This shows the UK international aviation emissions at 31 MtCO2e per year (155 MtCO2e over the 5 year carbon budget period). CCC report Presentation Slides Page 17.
International aviation and shipping have the same limit over three carbon budget periods, while other sectors have to make steep cuts in emissions. (155 is 5 x 31 MtCO2e. If the 1990 figure was taken instead, it would be 5 x 16 = 80 MtCO2e, rather than the 155). Induced cirrus cloud is only shown by dotted lines, rather than a red block, due to “high uncertainty”. The CCC Presentation Slides show the CO2 emissions from all UK sectors to have been around 695 million tonnes CO2 equivalent in 2006, (excluding embodied energy in imports) and they expect this to be down to 159 MtCO2e by 2050. Of this, in 2006, international aviation and shipping accounted for 42 MtCO2e. On Page 6, the CCC shows international aviation and shipping being 6% of total UK emissions (excluding embodied energy in imports) in 2006, and 30% by 2050. On Page 11, the CCC says that if IA&S was not included in UK total CO2 targets, the target of an 80% cut by 2050 would need to be increased to an 85% cut, and it would be less transparent and more difficult to manage. On Page 14, the CCC says that other sectors of the UK economy will have to make considerably more effort to manage the cuts, when aviation in included, and it allowed not to make carbon cuts. Other sectors have to find cuts of 70 MtCO2e in 2020, due to the inclusion of international aviation. Contrails are lines of cloud caused by aircraft flying through supersaturated air. Induced cirrus cloud comes from spreading contrails, or from aircraft aerosol emissions. At the level aircraft fly, both have a significant warming effect but this only lasts up to a few hours. The actual extent of aircraft induced cirrus cloud and the magnitude of the current warming associated with the increased cloud is very uncertain. The best estimate is that it is comparable to the CO2 impact of aviation, but it could be a small fraction of it or up to three times as large. There is scope to reduce these along with CO2 emissions through flight path optimisation (e.g. routing of aircraft to avoid or make use of certain weather systems) although in some cases there may be a trade-off between CO2 and cloud reduction. increase NOx or contrails and induced cirrus. Therefore the appropriate approach is to develop scientific understanding, and to ensure that options to markedly reduce contrails and induced cirrus are developed over the next decade. contrails and induced cirrus in several decades, this would be a cause for concern, and could require that carbon budgets are tightened in order that the climate objective is achieved. This is something that we will monitor in the context of our annual reports to Parliament and advice on setting carbon budgets. 2050 broadly at 2005 levels and for shipping emissions around a third below current levels in 2050. (In 2009) The Government also announced a new target for aviation emissions in 2050 to be capped at or below 2005 levels, and requested that the Committee on Climate Change advise on how best to meet this target. In December 2009, the Committee published its advice, concluding that given likely developments in technology and biofuels, demand growth should not exceed 60% between 2005 and 2050 in order to meet the target. An 80% emissions reduction excluding international aviation and shipping emissions implies emissions from other sectors of 2.2 tCO2e per capita in 2050 in the UK. This increases to 2.7 tCO2e per capita when emissions from international aviation and shipping are added, assuming these are around 2005 levels for aviation and around a third below current levels for shipping. This level of per capita emissions, if replicated globally, would increase the risk of dangerous climate change (e.g. increasing the probability of exceeding 2°C by around 10%, see Figure 1.4). and could result in carbon budgets being insufficiently ambitious. Until longer-term global or EU agreements limiting emissions from international aviation and shipping are agreed, the emissions pathways in section 3 above should be regarded as proxies for outcomes under international agreements, and should be used as the basis for planning assumptions. These imply international aviation emissions in 2050 at around 2005 levels, and 2050 international shipping emissions roughly a third below 2010 reported levels. exposed to a carbon price that reaches £200/tCO2 in 2050; in our ‘Likely’ scenario, emissions reductions were delivered through a 0.8% annual improvement in fuel efficiency, by meeting 10% of fuel demand with biofuels and by constraining demand growth to 60% from 2005 (a 75% increase from 2010 given that demand fell during the recession). economy, and up to around 20% biofuels use if CCS is not available. Achieving 2050 emissions at 2005 levels can then be achieved through a 1.2% annual improvement in fuel efficiency of planes, 10% biofuels use and a moderation of demand growth to 90% on 2010 levels. which emissions return to 2005 levels in 2050.19 Their scenario assumes demand increases in line with DfT’s 2011 analysis (i.e. a 125% increase from 2010), with offsetting savings based on a combination of improvements in engine and aircraft efficiency, improvements in aircraft operations and air traffic management (combining to give a 1.2% annual carbon intensity improvement), and an 18% emissions saving from use of biofuels (Figure 3.3). On Page 41 is a chart showing models with 10% , 20% and 40% use of biofuels in aviation by 2050. Greenhouse gas emissions from international flights and shipping should be included in the UK’s carbon budgets, the Committee of Climate Change has advised. The government’s independent advisory group says aviation and shipping were major sources of pollution. Therefore the carbon budgets up to 2027 should be increased to allow for those emissions. The government must decide by the end of 2012 on whether to include them. Under the Climate Change Act, the UK is committed to cutting all its climate-changing emissions by 80%, based on 1990 levels, by 2050. However, international flights and shipping are not included in the targets. If the government agrees to the CCC’s recommendation, it will mean tighter targets for other sectors such as motoring and electricity generation. The committee has recommended – and the government has already adopted – a series of carbon budgets setting down the maximum scale of greenhouse gas emissions that the UK can emit over successive five-year periods. These have been agreed up to 2027, and assume that aviation and shipping will be included. The committee’s chief executive David Kennedy said there was a “risk” the current – or future – government would not continue to make that assumption and the goals for cutting overall emissions would become less ambitious. Mr Kennedy said: “There’s a risk this government or a future government will not continue to act in the way we have done up until now. “At the moment there’s uncertainty over how aviation or shipping emissions will be treated in the future. He [David Kennedy] also said the UK should not try to unilaterally reduce emissions from the two international sectors, which could hit its competitiveness. “If you have draconian policies, people will take a short-haul flight to Holland, France or Germany and get on their long-haul flight. “There wouldn’t be a very well-connected economy and will you get inward investment from international companies?” he said. The latest report from the committee also confirms that it is possible to achieve the 2050 target, including aviation and shipping, at the expected cost of 1%-2% of GDP. Posted: Thursday, April 5th, 2012. Filed in Climate Change News, General News, Recent News.